Craft Stamping Quartet: Long Time ............. No Posts!!!! First of all let me offer a big apology to all you kind people who have kept checking only to be disappointed that there was nothing new to see. Unfortunately in some ways, life has been throwing a few curved balls at my buddies and I. I've been quite lucky in that most of my distractions have been pleasurable ones but poor Judith and Elaine have both been laid low by nasty viruses as well as being kept busy in other areas. Hopefully, they are both on the mend now. Anyway, I have finally managed to get round to the project that I chose for us this month. I was very taken with Joanne Wardle's beautifully clean and uncomplicated cards on page 74 of the October issue of Craft Stamper. I had a feeling that they were not as simple as they looked and a big part of the challenge for me personally was to keep them 'simple'. I always find it a little difficult not to try and fill a large white space, Lol!. Having said that, once I got into the swing of making these cards, they became quite addictive and although my challenge to my friends (and myself) was to make a set of three cards each, I'm actually posting four and I have, in fact, made a couple more for cards that I needed in a hurry. This first example wasn't totally successful in my opinion. I wanted to try that particular image because I like it's delicacy so much but obviously with not being a silhouette stamp the blended colours showed through where the image overlapped. I also don't think the colour block is the right shape but I still quite like it. As you can see I decided not to keep my blocks of colour symmetrical so that I wasn't 'copying' Joanne. 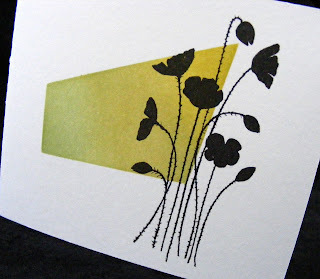 I think this Stamp n' Store image that I bought in a set of stamps from QVC when I first started stamping (and previously unused) works particularly well with this coloured shape. 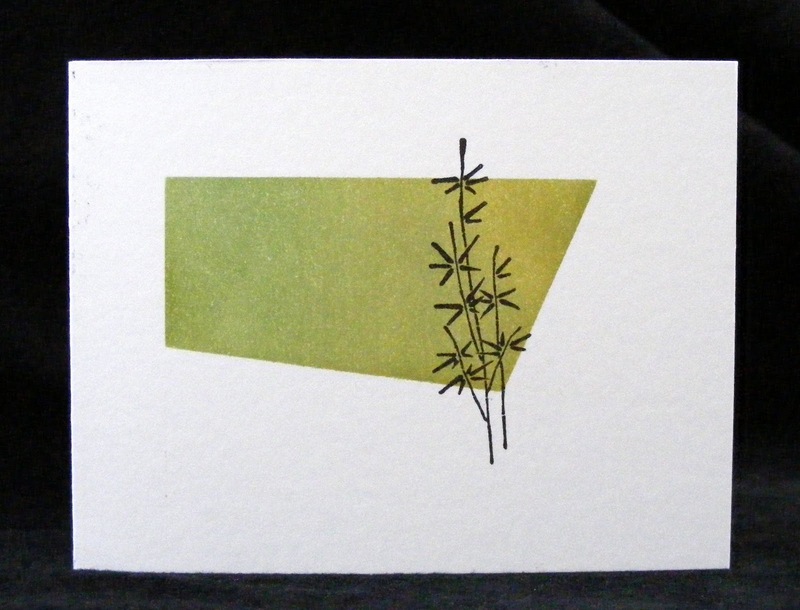 These last two cards are quite small at about 3.5" x 4" and were made from scraps. I'm quite pleased with both of them as I think the two images work well for different reasons. I really like the Lavinia Poppies and the Elusive Images design from the Eastern Grasses set is one of my favourites. I think this little card has an oriental look to it. 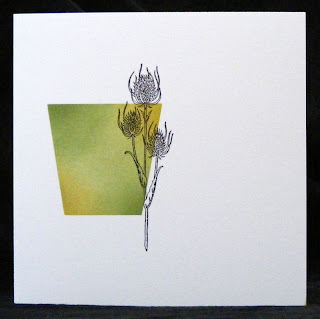 I think these cards are so useful and can either be left as they are or just add a very simple sentiment to make a card suitable for any occasion. 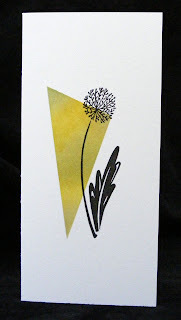 I could have gone on making loads of these trying out different shapes, stamps and colour combinations. 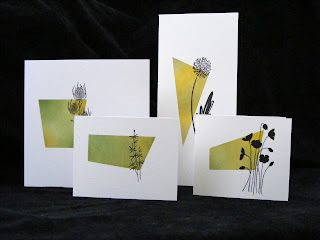 On these particular cards I used three colours on each from a selection of Adirondack inks in Juniper and Meadow and Distress Inks in Shabby Shutters and Crushed Olive. Hopefully the other girls will find time to get their take on this particular project done fairly soon but I can say that I have really enjoyed playing with these and will definitely make more. Once again, I'm sorry we kept you waiting and thanks for sticking with us. I'm wondering what project Elaine is going to choose for us next as she has not given us any clues at all, Hmmmmm!!!! Love them, they are so simple but very classy and would be suitable for many occasions. A case of less is more I think....lovely. beautiful take on Joannes idea. Good to see you back again and these cards are so simple and elegant but deceptively so because I can imagine quite a bit of work was required to achieve the effect. Great stuff. Lovely! I too have difficulty keeping things simple... I should have a go! Lovely take on the Clean and simple. 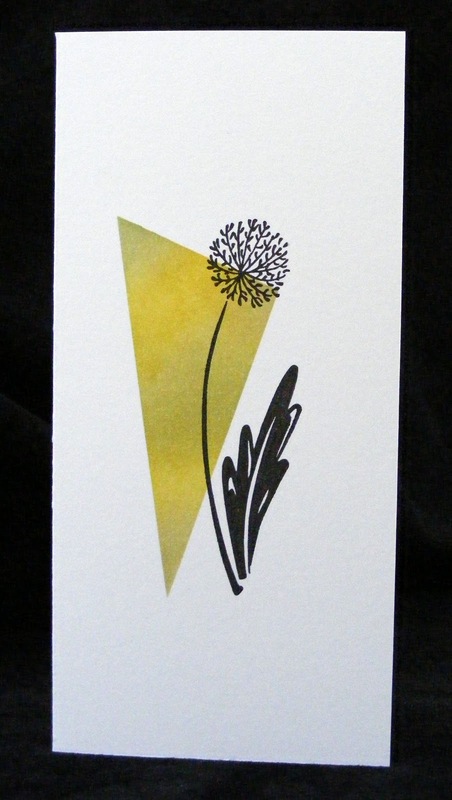 The background shapes are wonderful with the beautiful overlapping flowers. You are right, Lesley, this project set us a very different challenge and I have found it really refreshing. As usual, you are the colour queen with beautiful blending in colours so typical of your taste. These cards are so eyecatching and you have shown perfectly how versatile they are. Great start to this month's projects. Shhh...don't tell anyone, but I used this technique for my Christmas cards. I forgot to take any photos but I'll get a couple from friends after Christmas. I think yours have turned out much better then mine, but at least i gave it a go!! Hope you're all staying wrapped up. I bet I've gotten off worst, being here in the north east LOL!! Lesley, great start to our next project. Love your colouring and the different shapes you have used. I especially like the one I have christened the flower pot! This is really a challenging approach for me - you know me otherwise known as the queen of everything but the kitchen sink! Got my first panel coloured this evening though, so you have inspired me to get started! Lovely cards lesley. I have been playing about with something similar, but using colours this are a little more vibrant as the background. I do love the soft green. totally worth the wait! what a gorgeous set of cards. Thanks for reading my article. it feels so wonderful to have inspired someone, especially if it takes them out of their comfort zone.